The View on ABC Is School Right for 2-Year-Olds? Good Morning America ABC Tovah discusses the top mistakes parents make with their kids. NBC.com Tovah answers the question: Why Do Children Like Elmo? ABC Nightline Toddlers Obsessed with iPads: Could It Hurt Their Development? CNBC interview with Maria Bartiromo Tablets Empowering Children? CNN iPhone: Toy of Choice for Kids? P&G Everyday Toddler suddenly frightened of the dark? Super common! Here, five tips that may help. 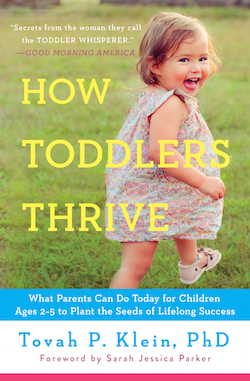 New York Times Letter to the Editor: When Is Medicating Toddlers the Right Intervention? NY Metro Parents How humor can save you when your kid’s mischief turns your world upside down. New York Times Letter to the Editor: Google, Tell Me. Is My Son a Genius? The Washington Post Why Women Leaders are Missing from Academic Life. Motherlove Blog Why do toddlers tantrum? Can they share? The Press Democrat For kids, what’s the right amount of screen time? NorthTexasKids.com Are You Inadvertently Shaming Your Toddler?